Ireland is one of the most fascinating places on the planet, with a fiercely proud citizenry, historic landmarks and more rugged, natural beauty than you can shake a stick at. 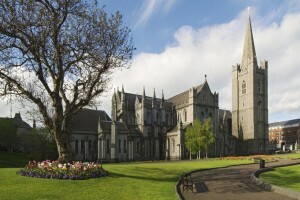 As the jewel of the Emerald Isle, you might expect that Dublin has it’s fair share of sights to see – and you’d be right. The trouble often lies in knowing exactly what to see because if you’re like most travellers, you have limited time and you don’t want to waste it. Call it a testament to the spirit and loyalty of the populace for a local landmark or a blessing in disguise, but the once slated to be torn down bar has become a fixture for travelers all over the world looking to take in a bit of urban, artistic feeling. You never know what you’ll find when you visit the Temple Bar as nights can range from being overrun by local artists or stag/hen nights – either of which can make for a memorable experience. You would figure the largest cathedral in Ireland would have a special place in the tourism of Dublin and you’d be quite right, as St. Patrick’s Cathedral is a wonder for travelers both secular and of the faith. For all those literary fans out there, it’s here that you’ll find the graves of Jonathan Swift (author of Gulliver’s Travels and A “Modest Proposal”) and his wife, among others. Don’t let the name fool you – this isn’t any ordinary park. In addition to being the world’s largest enclosed municipal park, it also houses the residences of the Irish President and U.S. Ambassador, while holding cricket and polo fields. As if this wasn’t enough, there’s also deer wondering around freely and a zoo – it’s definitely worthy of a few stops in if you get the chance. Not the most attractive castle in the world, (with the nickname ‘Irish Stew’) you’ll find Dublin Castle to have a little of everything in it’s architectural influences and compliments. It gives you a good idea of the history of the area as a defensive point in addition to the beautiful gardens and state rooms. You really can’t say you’ve been to Dublin if you haven’t been to the Storehouse. As one of the focal points of the city and the Irish culture, a visit to the Guinness Storehouse will show you the brewing process, how it’s transported and even cap it off with a free pint of the famed brew. What better way to cap off a Dublin holiday is there than that?